It's true that your IP address is no secret. It's a basic part of internet communication protocols to send your IP address whenever you connect to a website, send an email, make a forum/blog post, chat, play an online game, etc. Without your IP address, the computer on the other end wouldn't know where to send the reply. Think of it as the return address on an envelope. But that doesn't mean that Evildoers can find your home address if they know your IP address. Knowing your IP address does NOT give anyone the power to hack into your computer, NOR does it reveal who or where you are. Typically, each time you go online (if you have dialup) or each time you start your computer (if you have cable, fiber or dsl) you will be assigned an IP address, randomly selected from a pool of IP's assigned to your Internet Service Provider (ISP). If you use a large regional or nationwide ISP, the IP lookup probably reveals nothing of interest -- either the location of your ISP's local switching facility, or a placeholder address that corresponds to the center of the town where you live. The IP address for most dialup users will be the location of the ISP's central office. For AOL subscribers, your IP address lookup will always show the location as Dulles, Virginia -- regardless of where you live. And if you're connecting to a public wifi hotspot in an airport, library or coffee shop, the IP address will be associated with the wireless service provider - not you at all. Bottom line: The address returned by an IP lookup *could* be within a few miles of your home, or it could be wrong by several orders of magnitude. Of course there is an exception to every rule. If Joe or Jane User calls your ISP and wants to know who was using a certain IP address last Tuesday, the ISP will tell them to go away. But if an officer of the law hands your ISP a court order to reveal that information, they must do so. Your ISP's logs will enable them to determine which customer was using a certain IP address on a certain date and time, and they must reveal that information if a court has found probable cause that a crime was committed by that person. For the truly paranoid (or the criminally inclined) there are ways to surf the web anonymously. The Anonymizer service will act as a proxy between you and your ISP, and they claim that your information cannot be subpoenaed because they do not store it. See I Always Feel Like Somebody's Watching Me and Will a VPN Make You Safer Online? for more information about anonymous web browsing options. Want to learn more about online privacy? Se my articles Can You Delete Yourself From The Internet?, Is Everything Tracking You?, and Data Brokers: What Do They Know About You? The same concepts apply to your email address. The part that follows the "@" sign is the domain name. This can be your ISP, your employer, a webmail provider, or an email forwarding service. Given the domain name, one can determine the owner's physical location, but nothing personally identifying about the email user without a court order. Of course, if your email address is something like Jsmith90210@acme-widgets.com, then you're leaving little to the imagination of a determined hacker or stalker. Web-based email accounts are not truly anonymous, either. Even if you don't provide your real name when signing up, they can capture your IP address and track you through your ISP if necessary. But again, a court order would be needed. It's much more likely that you or your children will reveal your physical location the old fashioned way -- by just blurting it out. Kids who chat or play online games should be reminded often that they should never reveal any personal information, including their last name, phone number or home address. And of course, when you make an online purchase, you're explicitly providing your home address to the merchant. Oh, and if you have any spyware or viruses on your system, all bets are off. These things are designed to violate your privacy. If you need help with scanning your system for malware and other unwanted pests, see my article on free anti-virus software for details on how to protect yourself from those risks. 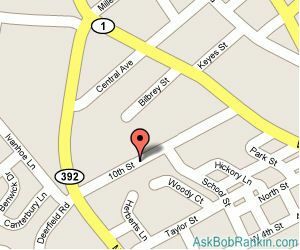 Most recent comments on "Does My Email or IP Address Reveal my Physical Location?" Another interesting article, thank you Bob. T'other day I was using Firefox to book an hotel on hotels.com when I was called away before confirming the booking. When I returned to my computer (WIN 10 alas) I found a message on my Facebook account reminding me to book before the rooms sold out. Odd, because I had not given a Facebook reference to hotels.com - and in any event I was booking under my wife's name and Hotels.com account. Someone out there is most definitely peering into my computer and watching what I am doing - how can this be and how can I "draw the curtains" on my computer?? You need to be aware that for customers using broadband (so many internet users), it is very likely that they will be using the same IP address for an extended period of time - likely months. In this case it could be possible to link the posts with other activities on the Internet. Similarly, an internet search on your email address, and possibly your suggested name (J Smith in Bob's example) may allow people to link you to other information that may give away more details about you. You'd have to be somewhat paranoid to worry about this. But I prefer the way Bob works - only publishing a user name - as publishing an email address opens you up to more spam coming. While your email address doesn't directly identify you, lots of companies (intellius, spokeo, pipl, etc.) scour public information and the Internet and may be able to identify you from your email address. And anything your publicly post may contain information that others can see possibly including your name, email address, etc. And since you give your email address together with your name, address, etc. whenever you do online shopping, any hacks of the sites you use (and there have been many of them e.g. Adobe, LinkedIn, Traget, etc.) can potentially reveal your information and may allow people to find you via your email address. EDITOR'S NOTE: Yes, you said more clearly what I was trying to explain in the last section of the article. In some cases, there are ways to connect the dots. It all depends on the trail of breadcrumbs you have left, and the extent to which trusted parties protect that information. Take a any device without cell service, or turn turn off cell radio. Connect WiFi. Load Google Maps. Google knows your precise address. EDITOR'S NOTE: That doesn't concern me. I've not seen any evidence in the almost 20 years that I've used Google services, that they've sold any of my personally identifying information to a third party. I responded to Publishing Clearing House's E-Mails for several months and lo and behold my E-mail box was flooded with all kinds of E-mails They undoubtedly sold my E-mail address to hundreds if not thousands of other companies. I stopped responding and many of those e-mails went away. @John - when using Google Maps - I believe your GPS is open and working to see the maps. Your GPS will almost always start from your home address or where ever your are at - So that you can get to where you want to go. Turn off your GPS and I think you will see a difference. In fact, Google Maps may not work as well - Since, you will need to type in the information of where you are at. @John - Additionally, the strength and direction of cell phone towers give a good indication on where you are. And ... When the Google street view cars went through they also mapped Wifi signals. Location by Wifi is a known technology. Seems to indicate that it is possible and was done by the people behind Breitbart and Trump. EDITOR'S NOTE: Ironic, because pundits claimed that the Obama campaign similarly used big data and social media targeting to defeat Romney in 2012. But at the time, it was seen as smart and savvy. Another good article people. Every one has brought out some very good personal points, but if we are going to live with this fear, should we even be on the www. I'm sure the Gov. knows my address, as do my creditors and friends, if I should be afraid of anybody else finding out, then they better not bring a knife to a gunfight. I refuse to live in fear. was useful to read, tnx. I also use VPN to protect my privacy and I often use what is my ip service to confirm that my real IP address is hidden. As for me, it's necessary to pay more attention to internet security. If you're REALLY concerned about your computer's IP address "giving away" your physical location, then by all means, use a virtual private network (VPN), which not only substututes your IP address with one set up by the VPN, but also encrypts all data that you transmit and receive. I have two VPNs loaded on my computer: AVG Secure VPN and CyberGhost. Both are excellent. I have two loaded on my computer because I use an unsecured Wi-Fi network at home whose signal is sometimes unstable. If one VPN cannot lock onto the signal, then I use the other VPN as a back-up. One other tip: If you live in a rural area and/or rely on Wi-Fi at home using an external long-range Wi-Fi antenna, make sure that your antenna is plugged directly into your computer's USB port. Do NOT plug it into a USB hub, as USB hubs act as "traffic controllers," which can render your Wi-Fi reception unstable.